Can a bath cure the common cold? Is it possible that taking a bath could heal the common cold, let alone work several other health wonders? I believe so. 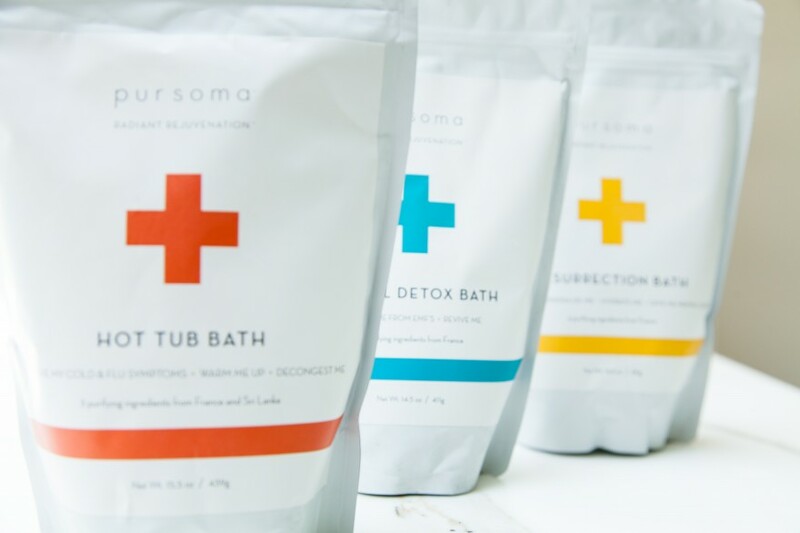 I first heard about Pursoma bath products from Shen Beauty, a brilliant skin and body care boutique in Brooklyn. Intrigued by the philosophy behind the products, "to help others reclaim healthier lives by detoxifying, rejuvenating and soothing the body from the inside out," I had to give them a try. In a blog next week, I'll be discussing the various baths that I tried out and their superb results. But today I'm talking strictly about the Hot Tub Bath which made a huge impression on me. This $35 one-time treatment comes in a package (see above) that includes a sea salt packet and a mixture of powdered ginger and clay. You spin it all together and soak in a warm bath for 15 to 20 minutes. Here are the claims. "Made from pure, raw, vegan ingredients, this potent recovery bath helps to warm and stimulate the body, aiding in the elimination of toxin build-up for when your body needs it most: to combat runny noses and chest congestion, body aches and fatigue. Warming ginger root assists in stimulating circulation, ridding the body of excess fluids and mucus. Sea salt helps to stimulate circulation and blood flow, opening the body’s cells to deep purification. Montmorillonite clay can support the absorption of toxin build-up as it aids in cellular revitalization and helps to restore the body to health." I can say with utmost confidence that this stuff works. I had been battling a nasty cold since the day after Christmas and after four days of misery, I decided to see if this could help me out. Immediately after exiting the bath I felt better. And in the few days following, my cold began to dry up and was gone. The science makes sense—you're essentially purging impurities and toxins from your body. Stay tuned for another review on the remarkable Pursoma products in the coming weeks and go draw that bath. Find Pursoma products at pursomalife.com.